To report the incidence outcomes of sterile multifocal inflammatory keratitis and diffuse lamellar keratitis (DLK) after small incision lenticule extraction (SMILE) in a large population. This was a retrospective review of a population of 4,000 consecutive eyes treated by SMILE at the London Vision Clinic using the VisuMax femtosecond laser (Carl Zeiss Meditec, Jena, Germany). The inclusion criterion was to have presented with inflammatory keratitis after SMILE. In some cases after SMILE, the inflammatory keratitis presented as sterile multifocal interface keratitis uncharacteristic of classic DLK. The incidence was measured and categorized as primary or secondary by presenting appearance, grade, and time to presentation. Patients were observed for 1 year after surgery and standard outcomes analysis was performed. Of the 4,000 eye population, there were 18 cases (0.45%) of DLK grade 1 or 2. All cases were managed and resolved with topical steroid therapy. Of these, 12 cases (67%) were of classic appearance and 6 cases (33%) presented as sterile multifocal inflammatory keratitis. DLK was primary in nature in 11 cases (61%) and secondary in 7 cases (39%). Postoperative uncorrected distance visual acuity was 20/20 or better in 93% of eyes. No patients lost any lines of corrected distance visual acuity and there was no change in contrast sensitivity. DLK occurred after SMILE with an incidence of 0.45% in this population. Topical steroid therapy resolved the DLK in all cases with no sequelae and no adverse effect on refractive or visual outcome at 1 year postoperatively. A unique type of DLK presentation can occur after SMILE, characterized by multiple focal sterile inflammatory spots. Management is the same as for classic DLK, but with a lower threshold for performing an interface washout. The grading of traditional DLK is determined by the severity of the reaction as classified by Linebarger et al.4: grade 1 = the presence of white granular cells in the periphery of the lamellar flap; grade 2 = the presence of white granular cells in the center of the flap involving the visual axis, in the flap periphery, or in both; grade 3 = the aggregation of more dense, white, and clumped cells in the central visual axis, with relative clearing in the periphery; and grade 4 = the rare result of a severe lamellar keratitis with stromal melting, permanent scarring, and associated visual morbidity. The major cause for DLK was found to be related to biofilm and endotoxins that remained on the instrument when using a steam sterilizer, as described by Holland5 in 1999. Switching to dry heat sterilization solved the problem of DLK epidemics. However, primary DLK can still occur in rare cases and can also occur secondary to an associated complication such as an epithelial defect, epithelial slide (as seen with anterior basement membrane dystrophy), or related to a sterile keratitis or auto-immune keratitis. DLK is highly sensitive to steroid therapy and the majority of cases can be managed with aggressive topical steroid treatment.6,7 In more severe cases (grades 2–4), oral steroid therapy may be considered, as well as possible flap lift and irrigation to remove endotoxins. The aim of this study was to report the incidence and outcomes of sterile multifocal inflammatory keratitis and DLK identified following SMILE surgery and suggest a sub-classification system for the multifocal type. This was a retrospective non-comparative case series of all myopic SMILE procedures treated consecutively between March 2010 and February 2017 by two experienced LASIK surgeons (DZR and GIC) using the VisuMax femtosecond laser (Carl Zeiss Meditec, Jena, Germany) at the London Vision Clinic, London, United Kingdom. Informed consent and permission to use their data for general analysis and publication were obtained from each patient prior to surgery as part of our routine protocol. Because this was a retrospective study, an exemption from full institutional review board approval was obtained from the United Kingdom Health Research Authority. A full ophthalmologic examination was performed by an in-house optometrist prior to surgery as has been described previously.8 Manifest refraction was performed based on a standardized protocol designed to push maximum plus and maximum cylinder, and all optometrists had undergone refraction training and validation with this protocol.8 The manifest refraction was repeated again at a separate visit before the day of surgery by the surgeon himself and this refraction was used to plan the treatment. All SMILE treatments were performed using the 500-kHz VisuMax femtosecond laser (software version 2.4.0) by two surgeons (DZR and GIC). The VisuMax femtosecond laser has been described in detail previously.9–13 Details of the geometry and software set-up of the SMILE lenticule, cap, and small incision have been described previously.9–16 In all eyes in the current study, two incisions were created: a 2-mm incision superonasally and a 2-mm incision superotemporally. The cap thickness used was between 130 and 150 µm. The optical zone diameter used was between 6 and 7.5 mm. The SMILE procedure itself was performed using our standard technique as described previously.13,16–19 Single-use disposable instruments (Malosa Medical, Halifax, United Kingdom) were used for all cases to eliminate endotoxins from steam sterilization as a possible source of DLK. On completion of SMILE in both eyes, the patient was brought to the operating room slit lamp, fluorescein was instilled, and full central distention of the cap was achieved by centrifugal stroking using a dry micro-spear to ensure that any redundant cap (due to mismatch of cap vs bed length) was redistributed to the periphery. The target postoperative sphere was hyperopic for all patients younger than 42 years; a linear function was used whereby the target sphere was +0.66 diopters (D) for a 21 year old down to plano for a 42 year old. Our micro-monovision protocol20,21 was used for all patients older than 42 years, where the target sphere is plano for the dominant eye and −1.50 D for the non-dominant eye for the majority of patients. Patients were instructed to wear plastic shields while sleeping for 7 nights. Tobramycin and dexamethasone (Tobradex; Alcon Laboratories, Inc., Fort Worth, TX) and ofloxacin (Exocin; Allergan Ltd, Marlow, United Kingdom) were applied four times daily for the first week, which is our standard protocol for broad-spectrum prophylaxis. Patients were reviewed at 1 day and 1, 3, and 12 months postoperatively. Spherical refraction was obtained at the 1-day postoperative visit. Further follow-up visits included monocular and binocular uncorrected distance visual acuity (UDVA) and manifest refraction with corrected distance visual acuity (CDVA). Best-corrected mesopic contrast sensitivity testing was performed at 3 and 12 months. The day 1 postoperative examination was conducted by the treating surgeon (DZR or GIC), at which point the cap was adjusted at the slit lamp using a surgical spear if any microfolds were identified. All other postoperative examinations were conducted by an in-house optometrist. The classic DLK cases were graded using the Line-barger4 classification and management was determined by the severity of the inflammation. For grade 1 or 2 DLK, topical prednisolone acetate 1% (Pred Forte; Allergan Ltd) was added every hour to the standard medication routine (tobramycin–dexamethasone and ofloxacin) and the patient was scheduled for another review in 1 to 2 days. For cases identified as grade 3 DLK, an interface washout was considered in addition to the standard steroid regimen. If the case progressed to grade 4 DLK, then an interface washout would be performed immediately due to the risks of permanent haze and scarring. Cases of sterile multifocal inflammatory keratitis (atypical DLK) were treated in the same way as diffuse (classic) DLK cases, but with increased frequency of monitoring due to this being a newly described condition with no previous published treatment guidelines.3 These patients were seen daily for the first week and then every 3 days until the clinical features showed signs of improvement, as described in the previous case report.3 In the initial cases of multifocal inflammatory keratitis, a differential diagnosis of infection was considered for much longer, due to a lack of exposure to such cases and the significant risks associated with not treating infectious keratitis. Subsequently, these cases underwent more extensive corneal tissue cultures and were treated more aggressively with antibiotics. Once confidence had built in diagnosis and treatment of multifocal inflammatory keratitis, the treatment regimen was converted to that used for classic DLK, but with a lower threshold for performing an interface washout due to the increased risk of stromal melting associated with focal inflammatory lesions. The proposed classification and grading scale for multi-focal sterile inflammatory keratitis is described in Figure 1. The incidence of DLK within the case series was evaluated. The cases of DLK were defined as either primary or secondary. Secondary cases were further evaluated to determine the cause. 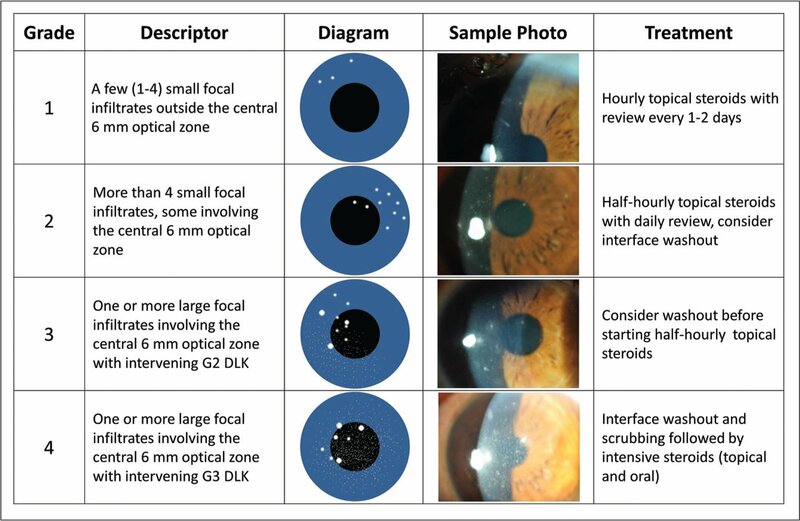 The cases were also evaluated to determine whether the presentation was that of classic DLK or sterile multifocal inflammatory keratitis3 and whether or not an interface washout was performed. Time to presentation was recorded, defined as the first day the patient presented with symptoms after surgery. 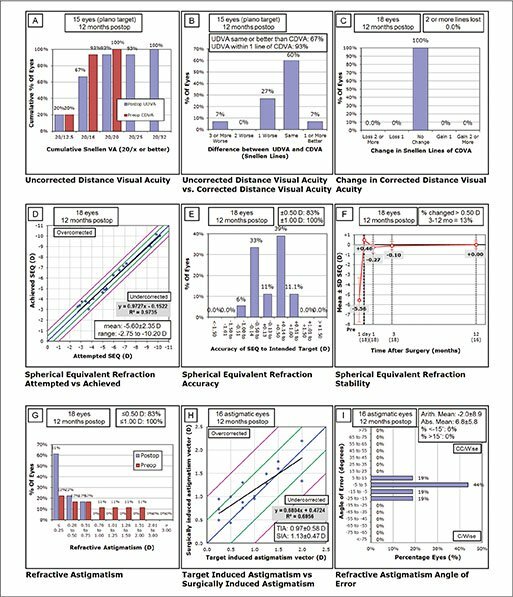 Outcome analysis was performed according to the Standard Graphs for Reporting Refractive Surgery.22 Eyes where the intended postoperative refraction was not emmetropia were excluded in the efficacy analysis. Data from the 1-year visit were used for analysis. Student's t tests were used to calculate the statistical significance of any changes in log contrast sensitivity. Microsoft Excel 2010 (Microsoft Corporation, Seattle, WA) was used for data entry and statistical analysis. A P value of less than .05 was defined as statistically significant. During the study period, a total of 4,000 primary SMILE procedures were performed. Of these, DLK was diagnosed in 18 eyes (0.45%). Table 1 shows the demographic data for the cases of DLK. Table 2 shows the etiology and presentation of the DLK cases, the grading, whether an interface washout was performed, and the time to presentation from surgery. The DLK was primary in 11 cases (61%) and secondary to an epithelial defect, epithelial slide, idiopathic immune sterile keratitis, or auto-immune keratitis in the other cases. There were 6 cases (33% of cases) of sterile multifocal inflammatory keratitis. Figure 2 shows slit-lamp photographs of the peak and postoperative presentation for these 6 cases. An interface washout was performed in 4 of these cases, whereas an interface washout was not required for any of the classic cases. All of the multifocal cases presented on day 1, and only 3 classic cases presented later than day 1, all of which were secondary to other causes. All cases resolved following the appropriate treatment. Clinically insignificant residual peripheral corneal haze was observed at 1 year in 3 of the multifocal cases. Slit-lamp photographs at peak presentation (left), postoperative presentation when considered stable or clear (middle), and the treatment regimen (right) for all 6 cases of the unique sterile multi-focal inflammatory keratitis. The grading according to the scale set out in Figure 1 is indicated on the first image. Pred Forte is manufactured by Allergan Ltd, Marlow, United Kingdom, and Vigamox is mnaufactured by Alcon Laboratories, Inc., Fort Worth, TX. Three- and 12-month data were available for all eyes that presented with DLK. Figure 3 shows the Standard Graphs for Reporting Refractive Surgery. Refractive and visual outcomes were comparable to routine SMILE and there was no change in CDVA. Table 3 demonstrates the normalized mesopic contrast sensitivity data before and after surgery showing there was no change at 3, 6, 12, or 18 cpd. There was a decrease of more than 0.25 log units (ie, 2 or more patches) in 1 eye at 12 cpd and a different eye at 18 cpd. One-year outcomes of cases of DLK after SMILE demonstrated that, as for LASIK, the condition responds well to topical steroid therapy and is associated with excellent efficacy and safety. One year after surgery, 93% of eyes with DLK achieved a UDVA of 20/20 or better and 100% of eyes were 20/25 or better. No eyes lost any lines of CDVA and there was no change in contrast sensitivity. DLK is a rare complication after SMILE, with an incidence of 0.45% from this case series. This is lower than the incidence of 1.6% reported by Zhao et al.2 in a case series of 1,112 eyes undergoing SMILE, but similar to the 1,800 eye population reported by Ivarsen et al.,23 where interface inflammation secondary to central abrasion occurred in 0.3% and there were minor interface infiltrates in 0.3% of eyes. For further comparison, a literature review was performed to identify reports of DLK after LASIK.6,24–40 The incidence of DLK after microkeratome LASIK ranged between 0.1%31 and 12.1%,39 but this last study was specifically reporting a DLK outbreak. The incidence of DLK after femtosecond laser-assisted LASIK tended to be higher, ranging between 0.4%32 and 37.5%.37 The overall incidence including all studies was 1.81% for microkeratome LASIK and 5.28% for femtosecond laser–assisted LASIK. The higher incidence associated with femtosecond laser flap creation is likely to be secondary to the inflammatory cell infiltration and stromal cell necrosis, which does not occur when using a microkeratome.41 The incidence of DLK also appears to be related to the amount of femtosecond laser energy applied, which was found to be statistically significant in a study by de Paula et al.36 Tomita et al.37 reported a lower incidence with the Femto LDV (Ziemer, Port, Switzerland) compared to the IntraLase FS60 (Johnson & Johnson, New Brunswick, NJ) and hypothesized that this was related to the lower energy level of the Femto LDV. The VisuMax laser uses significantly lower energy than other femtosecond lasers, which may explain why the incidence of DLK is more aligned with microkeratome LASIK than femtosecond laser–assisted LASIK. The published range in DLK incidence may also be related to the instrument sterilization protocol used in the different studies, given the well-established association with residual endotoxins when using steam sterilization. Postoperative prophylactic treatment with corticosteroids can be used to reduce the incidence of DLK.42 However, this is not required if dry heat sterilization is used or through the use of single-use disposable instruments. DLK can present after SMILE with the same classic appearance seen after LASIK. However, in the current series one-third of cases presented as atypical sterile multifocal inflammatory keratitis. Management of this atypical form of DLK is essentially the same as in classic DLK using intensive topical and possibly systemic steroid therapy. However, the threshold for performing an interface washout should be lower in multifocal cases due to the increased susceptibility for corneal melting. 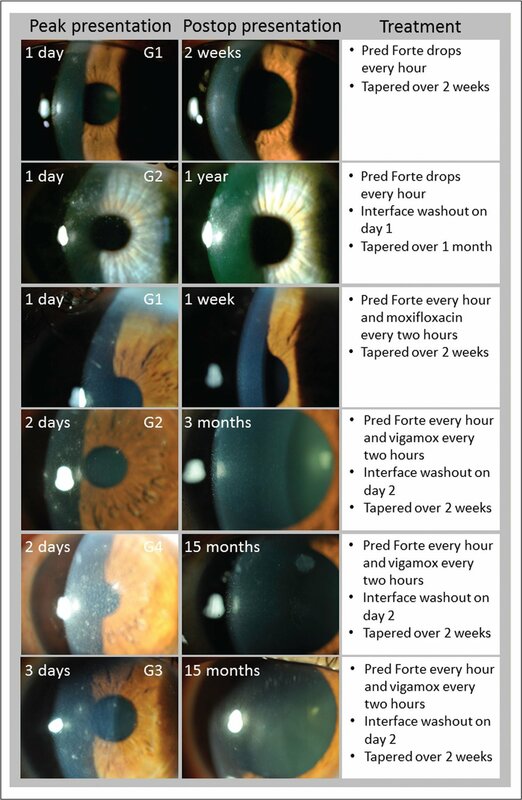 During our early exposure to multifocal inflammatory keratitis cases, infection remained a differential diagnosis for a longer period of time3 and the first patients continued to take intensive topical antibiotics until resolution. However, with increased experience and exposure to such cases, our confidence in diagnosing multifocal inflammatory keratitis increased and later patients were treated with high-dose topical steroids and a prophylactic dose of topical antibiotics. 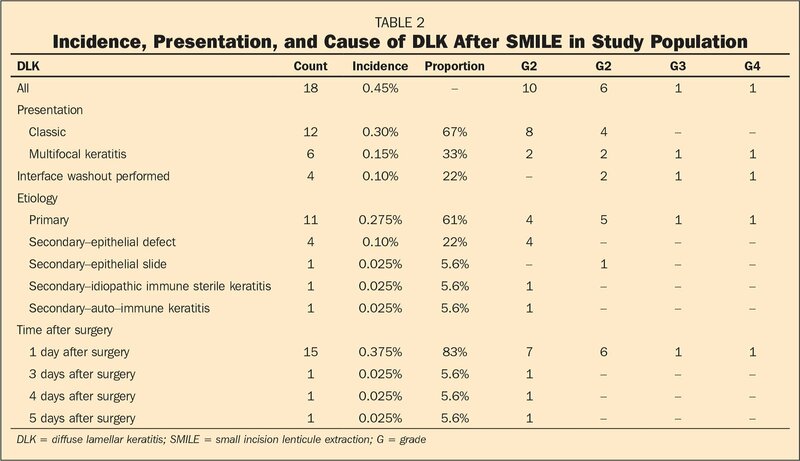 In cases of secondary DLK after SMILE, the most common cause was an epithelial defect. In SMILE, an epithelial defect can occur due to unintended mechanical friction of instruments against the surface adjacent to the small incision during interface separation. This risk can be reduced by appropriate preparation of the corneal surface; we routinely instill a drop of topical anesthetic before starting the lenticule interface separation, which also acts to wet the surface. It is also important to be aware of the dimension of the small incision to avoid inadvertently stressing the wound. Our preference is to use the same incision width for all cases for consistency, as opposed to programming the incision by angle, which changes the incision width depending on the cap diameter. Creation of an epithelial defect is more likely in cases where there is difficulty identifying or separating the lenticule interfaces, resulting in greater stress and trauma applied to the small incision and surrounding epithelium. Switching to the reserve small incision should be considered in such cases to limit the trauma to the epithelium and avoid a potential epithelial defect. In patients with known anterior basement membrane dystrophy, photorefractive keratectomy may be a more appropriate treatment because it also has a therapeutic effect.44 However, the VisuMax laser can be used for treating patients with anterior basement membrane dystrophy due to the low increase in intraocular pressure, suction applied to the cornea rather than the bulbar conjunctiva, and accurvation rather than full applanation.13,45 When treating patients with known anterior basement membrane dystrophy, care should be taken not to disturb the epithelium during the lenticule extraction part of the procedure. Similarly, cap positioning should still be reviewed at the slit lamp immediately after surgery, but without pushing too hard if some cap manipulation is required; it is more important to smooth any cap folds despite the risk of creating or enlarging a defect than to leave the cap with folds. DLK is a rare complication of SMILE that may present with the same classic appearance seen after LASIK, but may also present as a unique sterile multifocal inflammatory keratitis.3 We have introduced a grading classification for this sterile multifocal inflammatory keratitis presentation. Treatment is the same as for DLK after LASIK, with frequent topical steroid drops, but surgeons should have a lower threshold for performing an interface washout with multifocal cases due to the increased risk of stromal melting. Appropriate management of DLK after SMILE is associated with excellent visual and safety outcomes. Maddox B. Interface inflammation following LASIK. Presented at the American Society of Cataract and Refractive Surgery annual meeting. ; April 26–30, 1997. ; Boston, Massachusetts. .
Holland SP. Update in cornea and external disease: solving the mystery of “sands of the Sahara” syndrome (diffuse lamellar keratitis). Can J Ophthalmol. 1999;34:193–194. Reinstein DZ, Archer TJ, Carp GI. The Surgeon's Guide to Small Incision Lenticule Extraction (SMILE). Thorofare, NJ: SLACK Incorporated; 2018. Reinstein DZ, Couch DG, Archer TJ. LASIK for hyperopic astigmatism and presbyopia using micro-monovision with the Carl Zeiss Meditec MEL80. J Refract Surg. 2009;25:37–58. Noda-Tsuruya T, Toda I, Asano-Kato N, Hori-Komai Y, Fukumoto T, Tsubota K. Risk factors for development of diffuse lamellar keratitis after laser in situ keratomileusis. J Refract Surg. 2004;20:72–75. From London Vision Clinic, London, United Kingdom (DZR, AJS, RSV, TJA, GIC); the Department of Ophthalmology, Columbia University Medical Center, New York (DZR); Centre Hospitalier National d'Ophtalmologie, Paris, France (DZR); and Biomedical Science Research Institute, University of Ulster, Coleraine, Northern Ireland (DZR).